This recipe is one of those delicious comfort foods that we grew up with. We love it now just as much as we did 20 years ago! This recipe is so easy to make and everyone will ask for seconds! Mix together diced chicken, soup and sour cream in a large bowl. Add in Worcestershire sauce, garlic, and lemon juice. In another bowl, mix together crushed crackers, poppy seeds, and melted butter and stir until butter is completely incorporated. Spray a 9x13-inch baking pan with nonstick cooking spray. Spread chicken mixture on the bottom and top with cracker mixture. Cover pan with foil and bake for 15 minutes. Remove foil and bake for 15 more minutes. I love this! I make a similar casserole, which freezes really well and makes a great gift for a family with a new baby (or any other reason to gift a meal!). i'D LOVE TO KNOW HOW YOU FREEZE THE CRACKER TOPPING. THANKS! Me too! Making it for a family who just lost their baby and I want to be sure it is delicious and crisp on top. Just be careful because poppy seed is on the list of "don't eat" for breast feeding mothers. HUH? I am very surprised about the poppy seeds can not used for breastfeeding mothers? What is the main reasons? I have had breastfed all of my three babies. They appeared being fine. Why in the world would poppyseed be a problem for nursing mothers? I've never heard of that. My husband avoids poppyseed because he is subject to quite sensitive, random drug tests, but I wouldn't be afraid of nursing and eating them. Poppy seeds if you eat enough of them will cause you to be positive on a drug screen for opiates. So I am sure that is why you aren't supposed to eat poppy seeds while breast feeding. No one is drug-testing the babies. Lactation consultant here...no need to avoid poppy seeds when breastfeeding. Enjoy! Wow!! This looks insanely good and I cannot wait to make this! I think 90% of your recipes I am always willing to try because none are crazy intimidating and they are everything I adore as well! Please check out my Crispy Chicken and Feta Spinach Salad recipe that I had for dinner last night. It's similar with the poppy seed. YUM all around!! I've been making this for over 15 years without all the optional stuff. I love this dish and I make yellow rice and put this over it. Everyone loves it and begs for more. Funny that this is on the menu at our house tomorrow night! 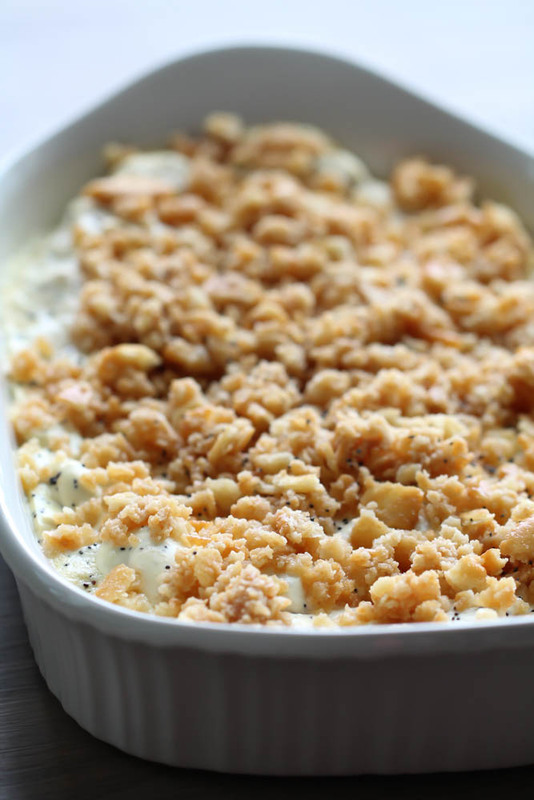 I make a similiar casserole using tuna as well as chicken and top it with crushed potatoe crisps and grated cheese, my family have always loved it. seriously dumb question but hope you will consider it worthy of an answer. HOW do you cook the chicken for the recipes??? baked--boiled--grilled--you get the idea of the question. I found this question and answer rather helpful. I never thought of boiling chicken breast. My mom didn't like poultry so I've had to learn on my own how to cook chicken. Great tip! I tried it yesterday and now I have 5 cups of cooked chicken in my freezer ready for recipes. Thanks! I but grocery store rottiserie chicken when rhey are on sale, shred and store in zip lock bags in the freezer. Perfect for recipes like this, no cooking time and cheaper than buying raw! I buy cut up bone in chicken. It is really cheap in my area. Then I cook it in a crockpot. Then I reamove the meat and put it in recipes. It cuts down on cost a lot! I also make my own white sauce because my kids cannot eat the artificial stuff in canned soup:-) Super yummy in other recipes! I am excited to try this! Hmm. not sure why the comment didn't show up, but I'm wondering the same thing. What is your go to method when recipes call for cooked chicken? I see that a lot in recipes and don't really have cooked chicken laying around, but would love any easy way to prepare the day before or cook a bunch and freeze for occasions like this. Thanks! Thanks! I never thought about just boiling. Thanks. Can this be frozen as is, or do you need to make any modifications first? Sounds delicious! Can't wait to try it. After thawing and now ready to reheat and cook what oven temperature would you reheat at and for how long? Heat oven to 350 degrees. Just keep checking on it until it is heated through really well. May take 30 minutes. I use at least three of your recipes a week. I love your recipes but this is the first time I've commented. I just wanted you to know you guys have given me the confidence as a new married wife to cook! Your food never has crazy food items that I've never heard of, or insane steps that make me want to cry! Thanks again you guys rock! What sides would you suggest serving with this? I had a friend bring this to me after my second child but that was a few years ago and I have no idea what we had with it. Salad? Any starch suggestion? What sides would you suggest serving with this? Salad? Any starch suggestions? I've had it before but I can't remember what we ate with it! What side dishes do you serve with this? I freeze it without the crackers and add those with less butter ( about 1/2) when I reheat it. It is a family favorite. We serve it with steamed broccoli, rice pilaf, and a yeast roll. Yum, yum! Another favorite side it the copy cat recipe for Texas Roadhouse green beans. Love! I make this (minus the optional ingredients) and it is always a hit. It's my go-to meal when I have to take food to anyone. I usually make green beans with it or broccoli and rice. I mix 1 tablespoon of poppy seed with 8oz of Monterey Jack cheese and put that on the chicken before adding the cracker/butter mixture. So I am breast feeding and someone mentioned no poppy seeds while breast feeding... Would this taste good without the poppyseed or is that what "makes" it delicious?? It will taste fine without the poppy seeds. Loved the recipe! It was soooo easy. I added 1/4 c. slivered almonds to the cracker topping and a can of green beans to the chicken mixture and thought it turned out awesome. My husband says he can't wait for the leftovers for lunch tomorrow! Thanks for posting a great recipe! Ive been making this for years! I also add In some fresh broccoli. Great easy, week night, comfort meal. How long do you cook if I already cooked it without the topping and then froze it? Just til heated through. Won't take very long if it is fully thawed. I have made a v similar version of this recipe before. Checkerboard Chicken. Instead of mixing the butter, we sliced small squares and dotted it on top of the crackers, the way it melted, if placed strategically, will make the topping look like a checkerboard. After letting the frozen casserole thaw and to reheat it again, what is the oven temperature and for how long in for the Poppy seed chicken casserole recipe? Mine came out runny. Is this normal? Smells DELISH!! It's gooey like in the picture, but I wouldn't call it runny. Not sure what could have gone wrong. I guess you could serve it up with a slotted spoon and let all of the juice run out before putting it on your plate. I actually have been making this same recipe for years, only instead of poppy seeds I use celery seeds. My whole family and friends who have tried it, love it! Added some lightly steamed cauliflower to add a veg and make it a full meal. SO YUMMY! You're posting all my favorites today! This is THE BEST chicken casserole. Ever. Hi Robin, just click on the MAGIC button under the picture. Then click on NUTRITION. It will give you all of the nutritional information and servings on our recipes. This is our sister site MyRecipeMagic.com. You can find nutritional info on all of our recipes! I made this tonight, and it was really good! I feel like it's missing rice or noodles though. Mine was a little soupy, so I added white rice and it was delicious! I LOVE this casserole! One night I didn't have Ritz crackers so I substituted Chicken in a Biskit crackers. Oh my goodness...if it is possible, it makes this even better! I just mixed this up to take to an after funeral meal at church. I started spreading in my 9x13 pan and it only took up about two-thirds of the pan. I had to switch it to another. Is anyone else having this problem? If I need a 9x13 pan next time, I'll double the recipe. I also took half of the poppy seeds and mixed them in the chicken, soup, sour cream mixture and the other half in the topping mixture. I like to see the seeds all the way through. I'm curious as to how the lemon juice and worcestershire sauce effect the taste. My dad made this for my family years ago and its now my husbands favorite recipe!! It is an awesome easy dinner to make. Love it! I couldn't find poppy seeds in the grocery store, so I used chia seeds instead. YUM! For future reference... where do you typically find poppy seeds? Poppy seeds are found by the spices and baking goods. I add about 2 cups cooked rice to the mixture before baking. Very yummy!